We R Memory Keepers have done it again! The Foil Quill collection is their latest innovative line of products that turns your electronic cutting machine into a foiling machine… wow! Now you can create amazing shine and shimmery sentiments on your projects by simply attaching a Foil Quill tip into your cutting machine… yes, it’s really that easy! What is the We R Memory Keepers Foil Quill? Simply put, the Foil Quill is a small heat tool that works just like a pen. The quills attach to your electronic cutting machine easily using special adapter pieces and just like that your electronic cutting machine is transformed into a fabulous foiling machine. For best value, we recommend getting the We R Memory Keepers All-In-One Set which contains all 3 quills to allow for maximum creativity (Pictured above)! Just like traditional foiling pens and machines, the foil quills use heat transfer technology to trace your chosen design on to your chosen material through foil. This avoids the need to have expensive laser printers and gives you a more accurate/professional finish. This set works with most electronic cutting machines like Cricut, Silhouette, Sizzix and Brother, using special adapter pieces. There are 3 different foil quills to help you get the exact look you want. The Fine tip heat pen (Pink, 0.5mm) is recommended for detail and small fonts, the Standard tip heat pen (Light blue, 1.5mm) is great for regular use and the Bold tip heat pen (Navy, 2.5mm) is recommended for thick lines. Also included in the set are x3 6” heat activated foil rolls in rose gold, gold and silver with placement tape to help secure the foil. For a step by step using tutorial check out I Heart Maggie for her experience using the foil quill! What materials does it work on? The Foil Quill works on most paper, cardstock, book board, vinyl, acetate, vellum, leather, fabric, and wood but results can vary depending on the type and texture of material, machine, and speed setting being used. It is recommended that when choosing a material, you make sure that it is untreated with a smooth texture (no sheen or pile, etc.). If you are unsure, it is always best to test the foil quill with a small piece of the same material. What design files to use? The Foil Quill works with any SVG files you have created but there is also an amazing selection of designs collections on thumb drives from Heidi Swapp, Paige Evans, Amy Tangerine, and Kelly Creates. What it the best foil to use? The We R Memory Keepers Foil Quill foil transfers using heat and pressure. This is something that has been extensively tested and optimized to provide customers with the best experience. For this reason, we recommend using the Foil Quill brand foil with the Foil Quill pen for the best results possible! The Foil Quill foil comes in a wide variety of colours so don’t worry about limitations! There are so many to choose from and they come in sheet and roll format for your different needs. 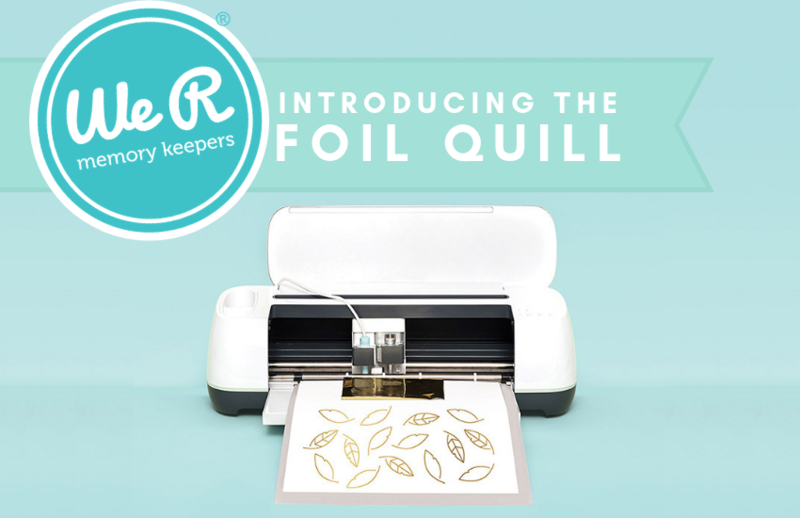 What do you think to the We R Memory Keepers Foil Quill? Don’t forget to leave us a comment below! Has to be the most exciting new craft product, and I can't wait for mine to arrive!